"Before Robert Duncan resigned, tensions simmered with Texas Tech regents for months" was first published by The Texas Tribune, a nonprofit, nonpartisan media organization that informs Texans — and engages with them — about public policy, politics, government and statewide issues. A widely respected former state lawmaker, Robert Duncan, now has another “former” position to his name: As of Sept. 1, he’s officially out as chancellor of the Texas Tech University System. Duncan abruptly announced on Aug. 13 that he would retire, explaining only that at 65, it was time to “move on and begin to tackle new challenges.” The surprise decision sent reverberations across Tech System campuses and down Austin’s Congress Avenue — and a cloud of confusion has lingered for weeks over his departure. Former colleagues and Tech supporters, who view Duncan’s ethics as beyond reproach, wondered why he left so suddenly, and whether he had been forced out. Rumors swirled that external power players had somehow been involved in the decision — an allegation rebutted by Tech officials, and also denied with varying degrees of ferocity by Gov. Greg Abbott and Texas A&M University System Chancellor John Sharp, who have both been accused of meddling. But records reviewed by The Texas Tribune and interviews with multiple people close to Tech leadership or state government reveal that tension had simmered between Duncan and a segment of his board for more than a year. Like so many matters in higher education, the disputes that led to Duncan’s departure revolved around two things: money and politics. The money needed to open a veterinary medicine school in Amarillo, a top Duncan priority. The capital required to back other system initiatives, like a proposed dental school in El Paso. And the money added to the Tech System’s administrative budget, which grew during Duncan’s tenure. “This was a fundamental disagreement about the vision, size, scope and budget of the system administration and nothing more,” said Rick Francis, chairman of the Tech System board of regents, in his first extensive interview since Duncan’s departure. Duncan, meanwhile, did not respond to specific questions for this article. He did provide a statement saying he was “grateful for the outpouring of support” he’d received since announcing his retirement. The first sign that there was trouble brewing might have come in the fall of 2016, when regents pumped the brakes on Tech’s plan to build a school in Amarillo focused on training large animal vets. An idea that dates back to the 1980s, Tech’s proposal has faced fierce opposition from A&M, the operator of the state’s only other vet school — a nationally renowned program but one critics contend produces too many pet-vets and too few that treat livestock. Sharp, the hard-charging A&M chancellor, has openly tried to quash Tech’s plan to build a vet school, and in a June op-ed he called attention to the "significant investment" veterinary education requires. A&M's vet school is an expensive enterprise, last year receiving an $18 million subsidy from the system’s budget and from donations, according to an A&M document reviewed by the Tribune. Having a second vet school in the state could siphon legislative funding away from A&M’s, expanding that nearly $20 million-a-year hole and forcing Sharp to use more of the system’s own money or bring in more gifts. "From outside gifts and downright subsidies, we have subsidized our veterinary school millions of dollars every year," Sharp wrote in the opinion article. "So, yes, we are concerned about diluting state appropriations when there is no real need to do so." Some Tech regents harbored their own concern about where the money for a Tech vet school would come from, or wanted to prioritize other system-initiatives, like a proposed dental program in El Paso, where Francis is from, or the expansion of an engineering program. In any event, the regents made a choice in late 2016. The board put the vet school on pause and soon sent a message to Duncan: Raise money or stop pushing for this. A source close to Tech who has spoken to Duncan since his departure said, despite community interest, Duncan believed support from the governor’s office for their vet school began to wane around the fall of 2016 due to Sharp’s lobbying. But Francis rejected the notion that external parties had pressured the board. "I can say I've never had a call from the governor, from the lieutenant governor, from former governor [Rick] Perry,” he said. “There are all these conspiracy theories." In regards to promoting A&M's vet school in late 2016 and early 2017, however, Sharp said: “I talked to everybody I could because the evidence is so compelling that Texas A&M has already solved any problem that ever existed." He cited a 2016 report that said demand for veterinarians is "moderate and closely aligned with supply." "We are good stewards of the money"
According to Francis, the 2016 vote was a responsible business decision — nothing more. He said regents became aware around Dec. 2016 that the proposed vet school could leave them staring down the barrel of more than $100 million in start-up and operating costs over five years. At a February meeting, regents took a harder tack against the school, adopting a resolution that said system officials would not “pursue funding” for the vet program during the session due to “limited budget funds available to the state of Texas” and “because of the need to emphasize other funding priorities” for the system. Then in May, lawmakers supportive of the vet school set aside $4.2 million for Tech to study how feasible it would be to build a vet school, and Duncan ramped up his fundraising. The Amarillo Economic Development Corporation, which is funded by municipal tax dollars, had offered $15 million, and by 2018, the corporation came forward with a new promise — saying it would pay up to $69 million if philanthropy wasn’t able to cover the school’s estimated $90 million in startup expenses. The backing of the corporation didn’t assuage all of the regents, however. Public documents show the corporation agreed in 2016 to disburse 10 payments of up to $1.5 million each, on the condition that Tech spend a cumulative $50 million in payroll at the proposed Amarillo school over five years. Two years later, the corporation suggested it would distribute six payments of $4 million to $6 million each — and possibly more, with subsequent installments reduced based on how much money Tech received in donations. The system is required to continue fundraising through 2024. Combined with private donations, the $69 million guarantee helped Tech cover the expected $90 million in startup funding without the Legislature. To critics, however, the guarantee looked like a forgivable loan, one in which future donations would offset the pledged amount and one that came with an unpalatable requirement of payroll spending. The corporation did not respond to a request for comment. 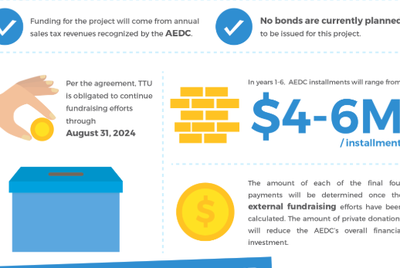 A screenshot of a graphic created by the Amarillo Economic Development Corporation detailing its financial support of a Texas Tech University vet school. Another source of internal strife was a proposed gift for $10 million, and how those funds would be split between the vet school and a pharmacy program that would be given the donor's name. The donor, Jerry Hodge, a former Amarillo mayor, said he could not confirm information about the gift when reached by phone. Tech regents could not be reached or declined to comment on the gift. “I’m disappointed that Chancellor Duncan has resigned,” Hodge said, urging the governor to not reappoint regents who had signaled no confidence in the chancellor. Some board members were concerned by how Duncan handled the vet school funding, and wondered if it was an example of him pushing for spending priorities that differed from theirs. That conflict came to a head in Aug. 2018 when the board gathered in Lubbock for routine regents’ meetings, and voted to move forward with the vet program proposal. They opted to spend some $1 million on initial designs, approved the school and its degree plan — and then took up another financial matter: system spending. Francis said there had been mounting concern about the growth of the system’s administrative budget, which increased some 17 percent during Duncan’s four-year tenure, even with reductions requested by the board. Between fiscal years 2005 and 2014, the administrative portion of the budget — earmarked for system-level staff and initiatives — grew less than 1 percent. Tech’s administrative budget is a small fraction, some 1.2 percent, of the system’s overall costs. Still, it amounts to millions of dollars a year, and is a kind of expense that fiscally conservative lawmakers and regents at systems across Texas often deign to be unneeded bloat or overhead. The administrative portion of the budget, which went from $20.9 million to a high of $25.4 million during Duncan’s tenure, could “go back to the component universities and ultimately limit the rise of tuition,” Francis said. During Duncan’s first three years as chancellor, “you had a series of double-digit increases and there began to be tension in that third year,” 2017, Francis said. Regents shot down Duncan’s proposed increase and passed a budget that held the system’s administrative funding flat. “The chancellor was looking, proposing to have a system administration that was larger and provided a scope of services that was more robust than what the regents felt was necessary. We are constantly looking to limit what I would call administrators so that we can maximize the money that goes into the classroom,” Francis said. “There was never any thought process that Bob Duncan was not anything but a man of integrity — a leader — and there was just a fundamental difference in the vision of what the system administration, what its size and scope of services” should be. The source close to Tech, who has spoken to Duncan, said and provided a document to show the administrative budget grew in part because attorneys and other resources were moved up from campuses to the system; because of the utility costs associated with a new system building; and because of a merit pay raise given to system employees. The source also said Duncan felt he faced internal headwinds in getting approved requests for legislative funding for the vet school. In 2017, the first year that regents held the budget flat, they also opted not to renew Duncan’s three-year employment contract in advance. Behind closed doors at the Aug. 2018 meeting, they again decided not to extend the agreement — leaving the well-liked chancellor with work through June 2019 at a rate of around $700,000 a year. At least it seemed that way at first. Francis declined to comment on what happened next, nor on anything that occurred in executive session, saying it was a personnel matter. 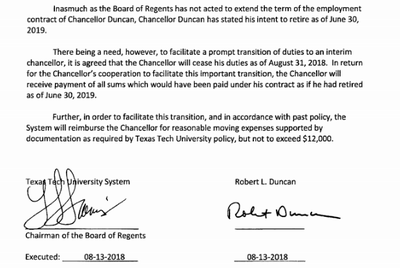 The source close to Tech, however, confirmed that Duncan, Francis and another regent had a private conversation soon after the contract discussion during which Duncan offered to announce he would retire at the end of next June. “Unfortunately, that isn’t going to happen,” the source said Duncan was told. A transition agreement says the early retirement date is attributable to a need "to facilitate a prompt transition of duties to an interim chancellor." Duncan announced soon after that he would retire effective Aug. 31; the transition document shows that he will be paid the amount he would have earned had he served out the remainder of his contract. A screenshot of Robert Duncan's transition agreement, provided to The Texas Tribune through an open records request. Duncan, in a statement, said he stood ready to assist the system's interim chancellor in any way he could. John Montford, a former Tech chancellor who has known Duncan for decades, said Friday he has "the highest opinion of Robert. His record demonstrates he is a great Texas leader." "I think these instances where you have a separation of possible priorities between the CEO and the board are not uncommon," Montford said. "The board is still the boss." He added of Duncan, "Somebody could get a real gem if they want to pick him up." Disclosure: The Texas Tech University System and the Texas A&M University System have been financial supporters of The Texas Tribune, a nonprofit, nonpartisan news organization that is funded in part by donations from members, foundations and corporate sponsors. Financial supporters play no role in the Tribune's journalism. Find a complete list of them here. Before Robert Duncan resigned, tensions simmered with Texas Tech regents for months By Shannon Najmabadi September 10, 2018 A widely respected former state lawmaker, Robert Duncan, now has another “former” position to his name: As of Sept. 1, he’s officially out as chancellor of the Texas Tech University System. Duncan abruptly announced on Aug. 13 that he would retire, explaining only that at 65, it was time to “move on and begin to tackle new challenges.” The surprise decision sent reverberations across Tech System campuses and down Austin’s Congress Avenue — and a cloud of confusion has lingered for weeks over his departure. Former colleagues and Tech supporters, who view Duncan’s ethics as beyond reproach, wondered why he left so suddenly, and whether he had been forced out. Rumors swirled that external power players had somehow been involved in the decision — an allegation rebutted by Tech officials, and also denied with varying degrees of ferocity by Gov. Greg Abbott and Texas A&M; University System Chancellor John Sharp, who have both been accused of meddling. But records reviewed by The Texas Tribune and interviews with multiple people close to Tech leadership or state government reveal that tension had simmered between Duncan and a segment of his board for more than a year. Like so many matters in higher education, the disputes that led to Duncan’s departure revolved around two things: money and politics. The money needed to open a veterinary medicine school in Amarillo, a top Duncan priority. The capital required to back other system initiatives, like a proposed dental school in El Paso. And the money added to the Tech System’s administrative budget, which grew during Duncan’s tenure. “This was a fundamental disagreement about the vision, size, scope and budget of the system administration and nothing more,” said Rick Francis, chairman of the Tech System board of regents, in his first extensive interview since Duncan’s departure. Francis called Duncan an “outstanding individual” and said he did not immediately come forward with the budget concerns because he thought “this was a personnel matter.” “Why I'm talking to you today is to try and make sure that I'm representing the regents, and am as transparent as possible with what took place and to put to rest any questions," he told The Tribune. "There was no malfeasance.” Duncan, meanwhile, did not respond to specific questions for this article. He did provide a statement saying he was “grateful for the outpouring of support” he’d received since announcing his retirement. “There is abundant and warranted speculation on the actions of the board of regents that led to my decision to retire. At the proper time, I will engage in those discussions,” Duncan said. “But, in the meantime, know my gratitude and devotion to Texas Tech remains great, as is my respect for the board of regents who have such a critical role in moving the system forward and meeting the challenges of today and tomorrow.” A 2016 pause The first sign that there was trouble brewing might have come in the fall of 2016, when regents pumped the brakes on Tech’s plan to build a school in Amarillo focused on training large animal vets. An idea that dates back to the 1980s, Tech’s proposal has faced fierce opposition from A&M;, the operator of the state’s only other vet school — a nationally renowned program but one critics contend produces too many pet-vets and too few that treat livestock. Sharp, the hard-charging A&M; chancellor, has openly tried to quash Tech’s plan to build a vet school, and in a June op-ed he called attention to the "significant investment" veterinary education requires. A&M;'s vet school is an expensive enterprise, last year receiving an $18 million subsidy from the system’s budget and from donations, according to an A&M; document reviewed by the Tribune. Having a second vet school in the state could siphon legislative funding away from A&M;’s, expanding that nearly $20 million-a-year hole and forcing Sharp to use more of the system’s own money or bring in more gifts. "From outside gifts and downright subsidies, we have subsidized our veterinary school millions of dollars every year," Sharp wrote in the opinion article. "So, yes, we are concerned about diluting state appropriations when there is no real need to do so." Some Tech regents harbored their own concern about where the money for a Tech vet school would come from, or wanted to prioritize other system-initiatives, like a proposed dental program in El Paso, where Francis is from, or the expansion of an engineering program. In any event, the regents made a choice in late 2016. The board put the vet school on pause and soon sent a message to Duncan: Raise money or stop pushing for this. A source close to Tech who has spoken to Duncan since his departure said, despite community interest, Duncan believed support from the governor’s office for their vet school began to wane around the fall of 2016 due to Sharp’s lobbying. But Francis rejected the notion that external parties had pressured the board. "I can say I've never had a call from the governor, from the lieutenant governor, from former governor [Rick] Perry,” he said. “There are all these conspiracy theories." Mac Walker, an Abbott spokesperson, also denied the governor was involved. “The only communications involving the governor before or during the last session about the dental and vet schools were to voice his support for both of them," Walker said. "It’s the reason he ultimately signed a budget that included over $4 million for the proposed vet school, as well as funding for the dental school at Texas Tech.” An A&M; spokesperson said Sharp had never communicated with Tech's regents about Duncan's departure or the vet school and that it was “hard to believe anyone would be so gullible to believe that he could have enough power to influence another board.” In regards to promoting A&M;'s vet school in late 2016 and early 2017, however, Sharp said: “I talked to everybody I could because the evidence is so compelling that Texas A&M; has already solved any problem that ever existed." He cited a 2016 report that said demand for veterinarians is "moderate and closely aligned with supply." "We are good stewards of the money" According to Francis, the 2016 vote was a responsible business decision — nothing more. He said regents became aware around Dec. 2016 that the proposed vet school could leave them staring down the barrel of more than $100 million in start-up and operating costs over five years. “We began to ask questions because we were having to go into the Legislature and ask them for money and we didn’t know where the startup costs were going to come from,” Francis said. “That’s when we took a vote to hit the pause button — not the cancel button, the pause button — to show the Legislature that we are good stewards of the money and we’re not going to commit the university to a venture that is almost like an unfunded mandate.” At a February meeting, regents took a harder tack against the school, adopting a resolution that said system officials would not “pursue funding” for the vet program during the session due to “limited budget funds available to the state of Texas” and “because of the need to emphasize other funding priorities” for the system. Then in May, lawmakers supportive of the vet school set aside $4.2 million for Tech to study how feasible it would be to build a vet school, and Duncan ramped up his fundraising. The Amarillo Economic Development Corporation, which is funded by municipal tax dollars, had offered $15 million, and by 2018, the corporation came forward with a new promise — saying it would pay up to $69 million if philanthropy wasn’t able to cover the school’s estimated $90 million in startup expenses. “Amarillo’s generous support — it really satisfies the anxiety about where the money is coming from,” said Francis, of that guarantee. It says, “we [the corporation] believe that our community is going to step up over the next few years and raise the money. But, as a guarantee that you can move this forward in the Legislature, we’ll backstop this.” A guarantee and a gift The backing of the corporation didn’t assuage all of the regents, however. Public documents show the corporation agreed in 2016 to disburse 10 payments of up to $1.5 million each, on the condition that Tech spend a cumulative $50 million in payroll at the proposed Amarillo school over five years. Two years later, the corporation suggested it would distribute six payments of $4 million to $6 million each — and possibly more, with subsequent installments reduced based on how much money Tech received in donations. The system is required to continue fundraising through 2024. Combined with private donations, the $69 million guarantee helped Tech cover the expected $90 million in startup funding without the Legislature. To critics, however, the guarantee looked like a forgivable loan, one in which future donations would offset the pledged amount and one that came with an unpalatable requirement of payroll spending. The corporation did not respond to a request for comment. A screenshot of a graphic created by the Amarillo Economic Development Corporation detailing its financial support of a Texas Tech University vet school. Another source of internal strife was a proposed gift for $10 million, and how those funds would be split between the vet school and a pharmacy program that would be given the donor's name. The donor, Jerry Hodge, a former Amarillo mayor, said he could not confirm information about the gift when reached by phone. Tech regents could not be reached or declined to comment on the gift. “I’m disappointed that Chancellor Duncan has resigned,” Hodge said, urging the governor to not reappoint regents who had signaled no confidence in the chancellor. "Cut your budget" Some board members were concerned by how Duncan handled the vet school funding, and wondered if it was an example of him pushing for spending priorities that differed from theirs. That conflict came to a head in Aug. 2018 when the board gathered in Lubbock for routine regents’ meetings, and voted to move forward with the vet program proposal. They opted to spend some $1 million on initial designs, approved the school and its degree plan — and then took up another financial matter: system spending. Francis said there had been mounting concern about the growth of the system’s administrative budget, which increased some 17 percent during Duncan’s four-year tenure, even with reductions requested by the board. Between fiscal years 2005 and 2014, the administrative portion of the budget — earmarked for system-level staff and initiatives — grew less than 1 percent. Tech’s administrative budget is a small fraction, some 1.2 percent, of the system’s overall costs. Still, it amounts to millions of dollars a year, and is a kind of expense that fiscally conservative lawmakers and regents at systems across Texas often deign to be unneeded bloat or overhead. The administrative portion of the budget, which went from $20.9 million to a high of $25.4 million during Duncan’s tenure, could “go back to the component universities and ultimately limit the rise of tuition,” Francis said. During Duncan’s first three years as chancellor, “you had a series of double-digit increases and there began to be tension in that third year,” 2017, Francis said. That year, “the regents basically pushed back and said, ‘Cut your budget.’ We're not trying to tell him where to cut or how to cut because we're not trying to micromanage. We're just telling him, ‘Here's the money,’” Francis said. "'You look through that budget and you determine what areas you can cut and or areas that the system doesn't have to be involved in.” Regents shot down Duncan’s proposed increase and passed a budget that held the system’s administrative funding flat. “We come and this year” — at the Aug. 2018 meetings — “he proposed a 15-percent increase in his budget … and we immediately pushed back and began this discussion about his vision versus our vision,” Francis said. The conversation became “acrimonious.” “The chancellor was looking, proposing to have a system administration that was larger and provided a scope of services that was more robust than what the regents felt was necessary. We are constantly looking to limit what I would call administrators so that we can maximize the money that goes into the classroom,” Francis said. “There was never any thought process that Bob Duncan was not anything but a man of integrity — a leader — and there was just a fundamental difference in the vision of what the system administration, what its size and scope of services” should be. “Ultimately,” Francis continued, "regents voted to leave the budget flat and not increase it as originally proposed and, in that process, they also began to lose confidence in the chancellor’s vision,” he said. “It was apparent there was a difference in opinion.” The source close to Tech, who has spoken to Duncan, said and provided a document to show the administrative budget grew in part because attorneys and other resources were moved up from campuses to the system; because of the utility costs associated with a new system building; and because of a merit pay raise given to system employees. The source also said Duncan felt he faced internal headwinds in getting approved requests for legislative funding for the vet school. In 2017, the first year that regents held the budget flat, they also opted not to renew Duncan’s three-year employment contract in advance. Behind closed doors at the Aug. 2018 meeting, they again decided not to extend the agreement — leaving the well-liked chancellor with work through June 2019 at a rate of around $700,000 a year. At least it seemed that way at first. Francis declined to comment on what happened next, nor on anything that occurred in executive session, saying it was a personnel matter. The source close to Tech, however, confirmed that Duncan, Francis and another regent had a private conversation soon after the contract discussion during which Duncan offered to announce he would retire at the end of next June. “Unfortunately, that isn’t going to happen,” the source said Duncan was told. A transition agreement says the early retirement date is attributable to a need "to facilitate a prompt transition of duties to an interim chancellor." Duncan announced soon after that he would retire effective Aug. 31; the transition document shows that he will be paid the amount he would have earned had he served out the remainder of his contract. A screenshot of Robert Duncan's transition agreement, provided to The Texas Tribune through an open records request. Duncan, in a statement, said he stood ready to assist the system's interim chancellor in any way he could. “Serving in that role is the highlight of my decades of public service,” he said, of the Tech job. “I will forever look back with pride in the steps we took to make it one of the premier institutions of higher education in the nation.” John Montford, a former Tech chancellor who has known Duncan for decades, said Friday he has "the highest opinion of Robert. His record demonstrates he is a great Texas leader." "I think these instances where you have a separation of possible priorities between the CEO and the board are not uncommon," Montford said. "The board is still the boss." He added of Duncan, "Somebody could get a real gem if they want to pick him up." Disclosure: The Texas Tech University System and the Texas A&M; University System have been financial supporters of The Texas Tribune, a nonprofit, nonpartisan news organization that is funded in part by donations from members, foundations and corporate sponsors. Financial supporters play no role in the Tribune's journalism. Find a complete list of them here. Read related Tribune coverage Vet school and budgets loom over well-liked chancellor's hasty exit from Texas Tech Analysis: Texas Tech’s regents ran off one of the rare good guys in politics Texas Tech System selects medical school president as its interim chancellor "Before Robert Duncan resigned, tensions simmered with Texas Tech regents for months" was first published at by The Texas Tribune, a nonprofit, nonpartisan media organization that informs Texans — and engages with them — about public policy, politics, government and statewide issues. Link back to the original article, which is located at https://www.texastribune.org/2018/09/10/robert-duncan-resigned-tensions-simmered-texas-tech-regents/.